In 1951 this painting was attributed to Francis Swaine. 1. The much lighter, brighter palette. 2. The softness of outline, and general looseness of manner. This is marked in Monamy, especially at this period, and contrasts strongly with, eg, the hard, enamel-like finish of late Brooking. 3. The stepped foreground water. James Taylor has a name for this effect. 4. The typical gesticulations of the figures. 5. 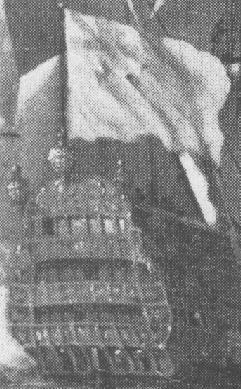 The very slight dilation of the flags, which often seem fractionally larger in Monamy's paintings. 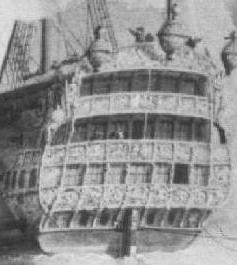 Unfortunately, it is not possible to tell from the photograph whether the vessel is flying a post-1707 canton. It may be, but doesn't look like it. A final point which makes this work typical of Monamy is: 6. The sensitive curvature of the staff flying the Royal Standard at the main. 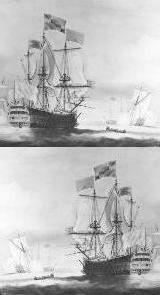 Compare flagstaffs below; and compare also Monamy's ship portrait of the Monmouth. 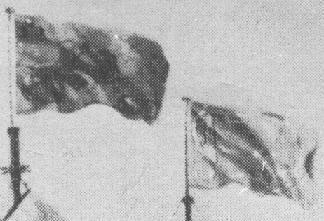 The left hand flags come from the painting below. 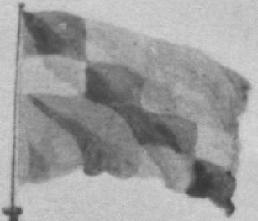 The Royal Standard to the right, with its staff bending in the breeze, from its chequered appearance must date from the reign of William and Mary, 1689-1702, which is distinctly odd. 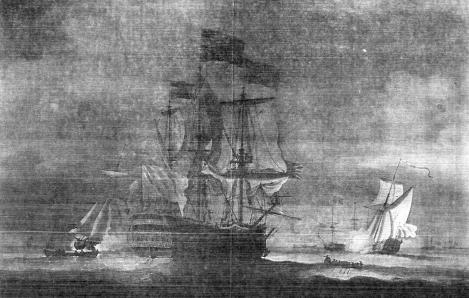 Stylistically, I would date the painting itself to shortly before the time of Monamy's Signal to Anchor, ie about 1726-1728. 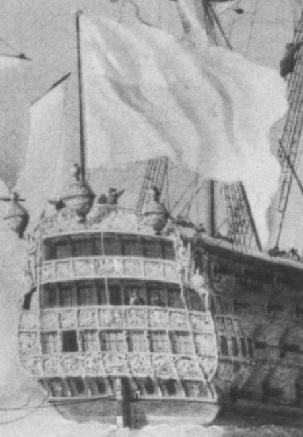 It is a puzzle to know why he would have painted a ship flying a flag of some 24 years earlier. Perhaps, since it is unsigned, he was passing it off to Mr Walker as a "Vanderveld". This is yet another version, auctioned as Backhuysen at a sale in Amsterdam, lot 7, May 1st, 1974. 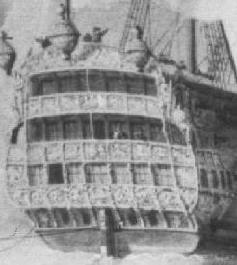 In 1982 Michael Robinson described it as The Royal Sovereign under way. Was the name interchangeable with the Britannia? These matters may be dealt with conclusively in his opus, which hasn't yet been checked. The canton appears to be post-1707, although that is not totally certain. 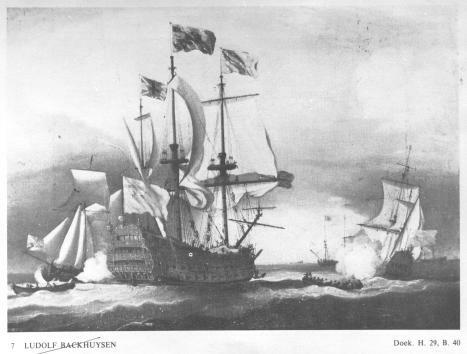 It is unlikely to be a copy by Backhuysen, nor would Robinson admit it to be by the Master; so who? Cornelius van de Velde? Woodcock? Some other, as yet unrecognized painter? 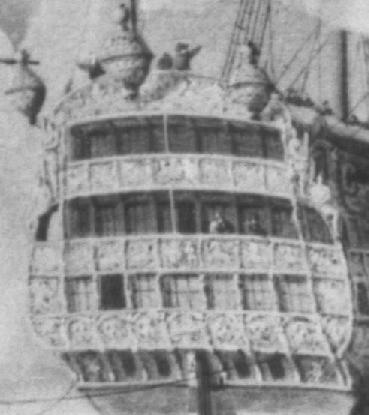 Could the stern in Monamy's painting be intended for the Royal Anne, or the Barfleur? 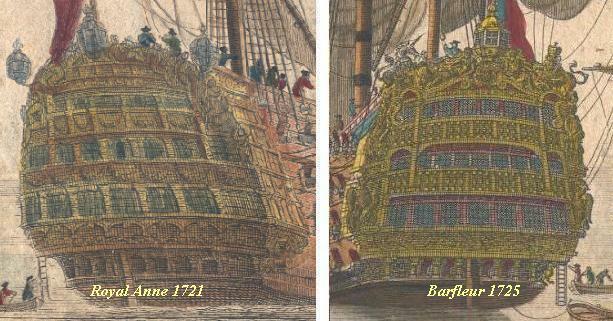 Both ships appear in prints by Baston, as above. 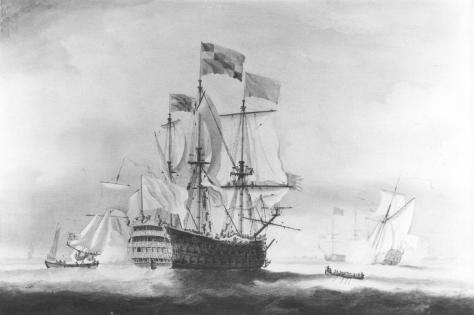 Both were commanded by Admiral Byng, Lord Torrington. Does it look like the Royal Anne? Although it doesn't resemble Baston's print, everyone wants it to be the Royal Anne. More research is indicated. But not really required: see end of story.